What do you do with all those ripe tomatoes you have just picked off from your garden, or bought at a farmer’s market? You can share them with your neighbors, if they don’t grow their own, and if you are certain that they like tomatoes and are not allergic to them. 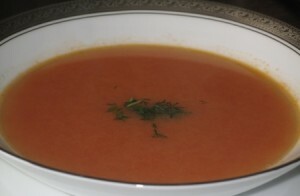 If you decide to keep them, but you really do not want to spend lots of time in the kitchen, by making home made tomato sauce, you can turn them into a very fast and easy, yet very tasty tomato soup. It really does not take much time, especially if you use ready made soup stock. You may serve it plain, garnished with chopped dill weed, or with rice or pasta. Sometimes I make my own pasta, when I miss my mom’s home cooking. Heat the butter in a saucepan, add chopped onions. Saute until golden, add chopped celery, and shredded carrot, and sauté 3 minutes longer. Heat the vegetable or chicken stock in a large pot, add the sauted vegetables to the stock. Add the cored, and quartered tomatoes, and bring to boil. Cook for 20 minutes, until the tomatoes and vegetables are tender. Pour through a sieve, and mash,the vegetables with a spoon, for few minutes , applying pressure against the bottom and sides of the sieve. Discard the remaining tomato skins and seeds left in the sieve. Mix the tomato paste with some of the soup stock and return to pot. Mix ½ of the heavy cream with 1 Tbs. of all purpose flour, into a smooth paste (no lumps). Mix in a couple of Tbs. of the soup stock into this mixture, mix in the remaining heavy cream. Pour into the soup pot, add a tsp. of sugar if the taste is too tangy, and bring to boil. You can peel the tomatoes before adding to the soup stock, by making a small 'X' on the bottom, and dunking them in boiling hot water for 15-30 seconds. The skin should slip off easily (it really works....I tried it). You will still need to pour the soup through a sieve to remove any seeds and other chunky vegetables, or puree it in a blender and pour through a sieve, then bring to boil once more. If you like a thicker, more textured soup, you need more tomatoes. I like my tomato soup on a thinner side, since I serve it with pasta. My mom used to make her own chicken broth by cooking chicken wings and backs, and used more heavy cream, which made the soup much higher in calories, but real delicious and creamy. Oh, I am definitely trying that tomato peeling technique. Thanks! It truly works!!! You will be amazed, if you ever get a chance to try it.